Jaundice is a common medical condition that develops in newborn infants. Caused by an excessive buildup of bilirubin, a pigment found in bile, jaundice can turn a child’s skin and eyes yellow or orange, a change that is usually harder to notice in kids with darker skin tones. Most cases of jaundice are harmless. That’s a good thing, because the condition is really prevalent. Around 60% of newborns develop jaundice, March of Dimes reports. It’s even more common in pre-term infants, but even in these cases, the condition usually goes away of its own accord within two weeks. Serious cases, however, can be life-threatening. Bilirubin is a neurotoxin; it can destroy or significantly impair nerve tissue, including brain cells. 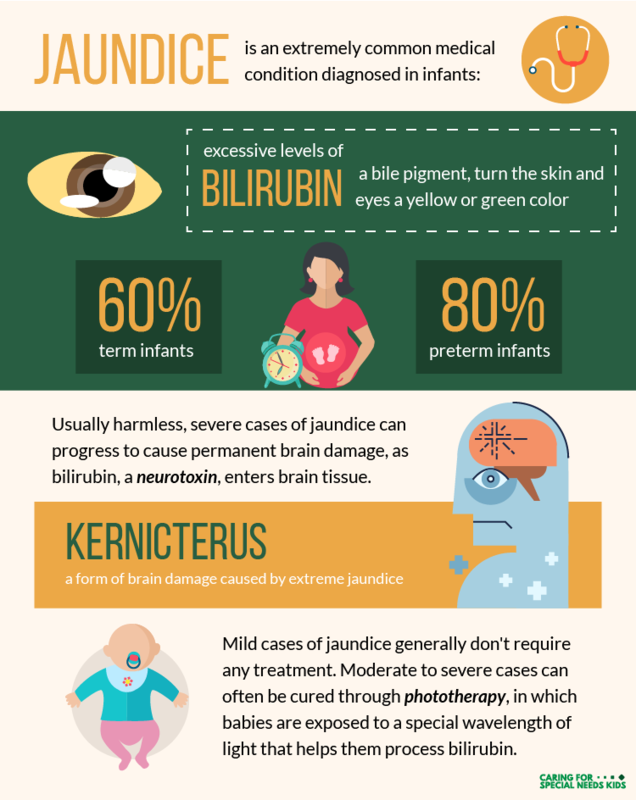 Left untreated, moderate cases of jaundice can quickly progress to become kernicterus, in which abnormal amounts of bilirubin begin to build up in the brain’s gray matter. Over time, this can result in permanent brain damage, leading to a range of neurological disorders, from hearing loss to athetoid movement disorders. The human body produces bilirubin all the time; it’s a byproduct of the process by which old red blood cells are broken down into their constituent parts. Adults and older children have no trouble dealing with it. A healthy liver filters bilirubin out so we can excrete the compound in bile and urine. Newborn infants, on the other hand, are usually born with underdeveloped livers. That’s not a huge problem; the liver will eventually catch up and begin filtering out bilirubin as normal. But at the beginning of a child’s life, their liver isn’t always up to the task. So the pigment builds up, leading to jaundice. As bilirubin accumulates in the body, the child’s soft tissues begin to take on the yellow pigment’s hue. Technically, the term “jaundice” refers to the appearance of a child who has developed a buildup of bilirubin. The underlying medical condition is known as hyperbilirubinemia. Under normal circumstances, the condition becomes apparent to the eye within the first few days of a child’s birth. According to the National Library of Medicine, the change in a baby’s coloration, which can be unsettling for parents, usually peaks around day three or four, then subsides by day five. Phototherapy – The infant is placed beneath a specially-designed light that only emits light within a specific band of the electromagnetic spectrum, between 475 and 510 nanometers (what the human eye would recognize as blue-green). On exposure, the light changes the shape of bilirubin, altering the molecules so they are easier to excrete. Hydration – Jaundice often causes dehydration, which in turn can make jaundice worse. Doctors often tell mothers to feed their children more frequently than normal to make up for any losses in hydration. Some women will need to supplement their breastfeeding with liquid formulas or expressed milk. More-frequent feedings can also lead to more bowel movements, which can help your baby pass more bilirubin in their stool. Blood transfusion – In severe cases, some children will require a blood transfusion. Physicians will replace a portion of the baby’s blood with donor blood that contains a healthy amount of bilirubin. Blood transfusions are generally considered a treatment-of-last-resort, only attempted after less-extreme interventions have failed. So far, we’ve only discussed forms of jaundice that develop because an infant is born with an underdeveloped liver. That’s how jaundice normally works, but it can also be caused by dehydration (usually the result of inadequate feeding) or certain factors in breastmilk that can impair liver function. Another potential cause is called Rh disease (or Rh incompatibility), in which the immune system of a mother begins to attack her unborn child. In these cases, physicians have a third treatment option: intravenous infusions of immunoglobulin, a protein that can help reduce the amount of foreign immune cells inside the baby’s bloodstream. It should be clear that many of these later-stage symptoms are neurological in nature, involving functions normally carried out by the brain and, to a lesser extent, a child’s muscles. Under prolonged exposure to elevated bilirubin levels, the child can suffer kernicterus, or chronic bilirubin encephalopathy, a form of brain damage. The most common result of chronic bilirubin encephalopathy is an impairment in hearing, according to Medscape. And, while this extreme result of jaundice rarely leads to cognitive impairments, some children are misdiagnosed with learning disabilities because they have trouble hearing. Most kids affected by kernicterus will have problems hearing high frequencies. These hearing problems, in turn, can lead to delays in language acquisition and other developmental achievements. In the realm of movement disorders, athetoid forms of cerebral palsy are most prevalent in children who suffered bilirubin-related brain injuries around birth. Athetosis is a neuromuscular disorder that causes uncoordinated muscle contractions, leading to involuntary movements. In most cases, these movements are described as “writhing”; they’re slow and contorted, and can also make it hard to maintain body postures for extended periods of time. Athetoid movements usually affect the fingers, hands, feet and toes. Chorea, on the other hand, usually affect the muscles in the face, hips and shoulders. These involuntary movements are quick, jerky and non-repetitive. Children will experience slow, involuntary writhing movements, predominantly in the fingers, hands, toes and feet. Chorea are less common, but also possible. These involuntary movements appear jerky, and usually affect the face, shoulders and hips. Can Doctors Prevent Kernicterus Brain Damage? Jaundice need not progress to kernicterus. When detected quickly and managed properly, jaundice can be effectively treated. In fact, the vast majority of kernicterus cases are entirely preventable, according to the US Centers for Disease Control & Prevention. While not every case of kernicterus is an example of medical malpractice, it’s certain that many children have suffered permanent brain damage due to a healthcare professional’s negligence. Michael Monheit, Esq. is an experienced medical malpractice and mass torts lawyer. Michael is the parent of a child with developmental delay and special needs. He also sits on the board for The Cleft Lip And Palate Foundation of Smiles. Michael has been appointed as lead plaintiffs' counsel, litigation group chair, and/or plaintiffs steering committee member in several mass tort lawsuits. He has been in practice since 1989.